LUMA system of Innovation equip organisation with a framework to transform their processes and communication (both internal and external) to be more design-led and innovative. It is built on Human-Centered Design – the discipline of developing solutions in the service of people – and grounded in the belief that anyone can be innovative, but might not know how. LUMA’s mission is not just to teach people human-centered design, but to help everyone become confident and capable problem solvers. In their years teaching the LUMA System worldwide, they’ve learned it takes more than formal instruction in a workshop. It also takes peer-to-peer collaboration and hands-on experience, supported by expert coaching and on-demand tools and resources. Companies face challenges on day-to-day basis which could simply be getting coworkers to agree on priorities or identifying the right problems to solve or something as facile as running a productive staff meeting on a regular basis. Making – You will find methods and tools for envisioning future possibilities. 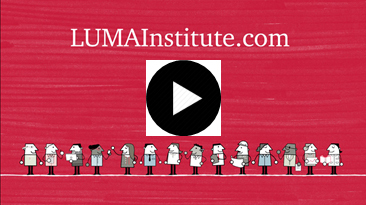 LUMA institute has hand-picked 36 most effective tools and methods of Design Thinking which can be used for organisational transformation. Knight Foundation supercharges early stage media projects through Human-Centered Design. Genpact, a GE spinoff, underpins Lean Six Sigma with Human-Centered Design to reimagine the future. Creative approach to problem solving makes it easier for kids in need to get school lunches.